Ever since their most recent buff, pulse rifles now serve a broad role in Destiny’s combat. These rifles bridge the gap between the popular auto rifle and the marksman’s scout rifle. Pulse rifles deliver a volley of 3 rounds for each firing sequence, rewarding Guardians with accuracy, sometimes resulting in a 2-burst kill. We also have a top 5 list for auto rifles and fusion rifles. Pulse rifles require more attention to detail than other weapon classes. Small alterations in the stats or perks can make pulse rifles perform in a radically different way. Like all primary weapons, there’s two archetypes you need to be aware of: The two ends of the spectrum are occupied by high and low rate of fire. Oversoul Edict for example has a high RoF, so you’ll usually want to pursue enemies in a short-medium range. With a slower RoF rifle like Three Little Words, you’ll want to be behind your team, targeting enemies with deadly and concise precision from a further distance. Because the nature of pulse rifles can be so varied, it’s important to know what you are going to use it for and what archetype it is. This is an incredibly important quality with pulse rifles. You need to make sure you are landing your shots well, otherwise you will lack in comparison to other users of pulse rifles. Generally stability isn’t as important for low RoF pulse rifles, but if it’s got a high RoF then great stability should be a top priority. Like many weapons, pulse rifles have some very specific types of recoil. Many have a lot of vertical climb, some veer off in a random direction, and others have a wide spread. Be sure to take a hard look at the first column in weapon’s upgrade tree that contains not only optics changes, but will also change how it behaves when you fire it. For example, while you may have a worse range, the recoil pattern might be more favorable, so you’ll want to test this thoroughly. This is the strong balancing point of pulse rifles and dictates how the weapon should be used. If it’s got a high rate of fire, use it aggressively. With a slow rate of fire, you’ll have to be slow and methodical with your engagements. Some pulse rifles suffer from a small magazine size. Pulse Rifles fire 3 rounds for each sequence, so you generally only get 7-10 bursts. It’s important to have a constant stream in the reserve, as you don’t want to exhaust your bullets in the middle of the heated firefight. You always want to be contributing constant support to your team (regardless of the weapon you’re using), and if you are reloading for too long you may be leaving your team without backup. Outside of the Crucible it’s all about two things: being able to hit hard from a distance. In the harder activities like Nightfall’s or a raid, generally slower rate of fire weapons will be an better option. Try to avoid hip firing with pulse rifles, their precision capabilities are just too valuable. Rangefinder gives your hard hitting rifles even more edge when you’re shooting from a distance. More bullets keeps you in combat longer, plain and simple. Unfortunately you won’t have access to Perfect Balance or Fitted Stock, but low RoF pulse rifles are generally easier to aim as it is. Because Pulse Rifles exhaust their ammunition so quickly, it’s nice to have any boosts to reload speed. Possibly the best perks you could have. If you are using high Impact rifles, either of these perks will give you so much more edge in long-range engagements. While holding down an area, you never want to get flanked – right? If you know exactly when and where the enemy is coming from while ADS, you can prepare for the next engagements with more confidence. Possibly the best perks you could have. The quicker you’re firing, the harder it’ll be to line up each burst. You’ll nearly always be emptying your magazine with high rate of fire rifles, so the quicker you’re able to reload, the better. This perk will actually only use 2 rounds from your magazine if you connect the entire 3-round burst to your target. Essentially it allows you to reload less often, because you won’t be using as much ammo as you normally would be, assuming you land your entire burst on your target. Based on versatility, damage output, base stats, and default perks: the following are the best Legendary auto rifles. Chances are, you will have different ideas on which rifles are the best, and we’d definitely like your feedback on which you prefer and why. The more input, the better the results! What holds this weapon back is its niche perks. Full auto is a nice touch that makes the weapon fairly comfortable to use, but ultimately it doesn’t allow it to preform any better. 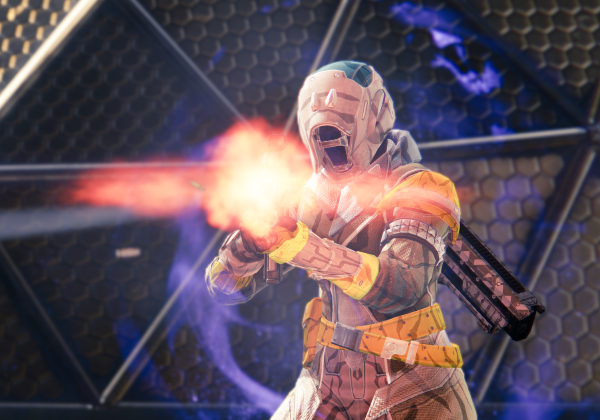 Unless you plan on battling against Hive, you won’t find any use for the two Hive specific perks that come with it in PvP. It is however an excellent choice for PvE since it counteracts their aggressive nature and breaks through the durable defenses of Knights. Use this weapon to get up close to your enemies and deny their presence with deadly aggression. If you’re looking for a pulse rifle with full auto that’s more useful in PvP, try out The Stranger’s Rifle, which recently featured in our second top 10 rare weapons list. A reliable assault weapon, it falls nicely between the passive support and aggressive pursuit pulse rifles. It is a well-rounded self-sufficient rifle that will benefit Rumble players and persistent scouts. It is particularly effective in the hands of independent players that are looking to weave through maps and methodically engage opponents. If you are skilled with pulse rifles and like to take on the approach of a rogue, this is a very suitable weapon for you. A vicious weapon with the most aim assistance, it rewards Guardians who are able to land their bursts accurately. The Secret Round perk (contrary to its description) will actually save you bullets; if all 3 bullets hit a target, you’ll only be charged for 2 of them! This weapon is equipped with some great CQB optics, ammunition, and stability increased perks that make it a real delight to use. In battles against aggressive enemies, this weapon has the stamina to stay on top and prevail, whatever the circumstance. 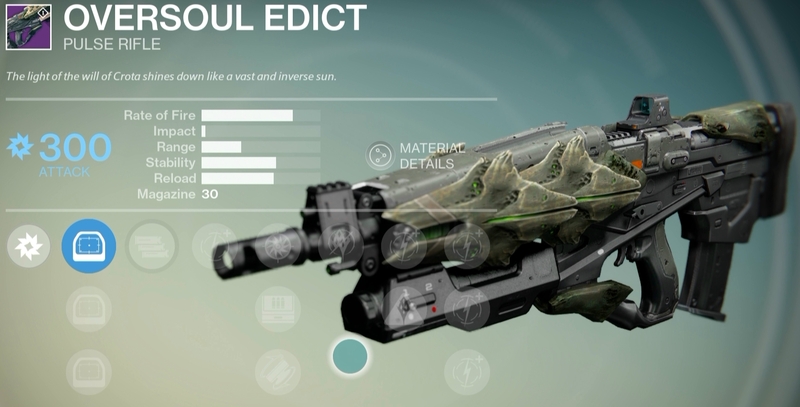 Tied with Oversoul Edict, it’s got the highest rate of fire out of the Legendary pulse rifles. This is an incredibly comfortable weapon to use. Its frame is non-obstructive and makes acquiring targets while aiming very easy, making it a desirable weapon to take into any activity. It supports an independent playstyle by offering a good balance between precision and rate of fire. You should be able to take down opponents with well place accurate shots even while under fire. It’s got the quickest reload speed which meshes well with its default Reactive Reload perk. A Legendary equivalent to the renowned Evergreen II.I (featured here), it’s one of the few Legendary pulse rifles currently available with 30 Impact; perfect for the Crucible! Something that makes this weapon truly brilliant is its standard vendor perks: Third Eye and Headseeker. All in all, this is a great team support weapon that can easily hold its own if you’re by yourself. It’s got the highest Impact and range, making it absolutely destructive in any situation.